AERVOE LED Road Flare Kit - Red (6-Pack w/ Charging Case) (1163) » Protective Solutions, Inc. The Universal Road Flare Kit contains 6 extremely durable, rechargeable 18-LED Classic Road Flares that are a safe alternative to incendiary flares. These flares are smokeless, flameless, non-toxic, waterproof, crushproof and come with an impact resistant rubber housing. Ideal for road safety identification by emergency responders. 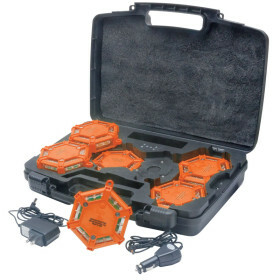 The kit is a durable transport case that not only stores the flares but keeps them charged for use when needed.